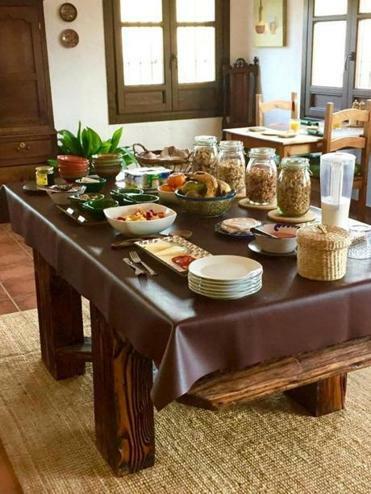 At Casa Olea, the breakfast buffet offers local meats and cheese, eggs, pan con tomate (tomato puree spooned onto bread), homemade preserves, and pastries. PRIEGO DE CORDOBA, Spain – Casa Olea sits in the middle of an olive grove without a single residence around it. There isn’t a little market anywhere near the six-room inn, nor a gas station, nor commerce of any kind. From the second-floor rooms all you can see is miles of trees in neat rows forming a kind of patchwork, the Sierras Subbeticas mountain range and a national park of the same name, and a pool that looks especially turquoise in this landscape. This is the heart of Spain’s olive country. Andalusia, in the south, is one of the leading producers of olive oil in the world. Opening a business in such a rural spot was so risky that most banks in the region wouldn’t offer British innkeepers Tim and Claire Murray-Walker a thing. “Who’s going to come to a house in an olive grove?” one banker asked the couple. The place they intended to renovate was a ruin, a 150-year-old cortijo, as Andalusians call their rural stone farmhouses. They did get one bank’s nod of approval — from a loan officer who rode his bike on these quiet roads and had sped past the farmhouse. The couple spent more than five years renovating (the house had no plumbing, electricity, or running water), and installing a kitchen to serve nightly dinners, a bar in the dining room, a sitting room with a fireplace, and six bedrooms. They opened in 2009. Now they press olives from the trees in early November, when the young fruits have less oil, but make the best-quality pour. It’s not something most commercial enterprises do. Sheryl Julian for The Boston Globe. 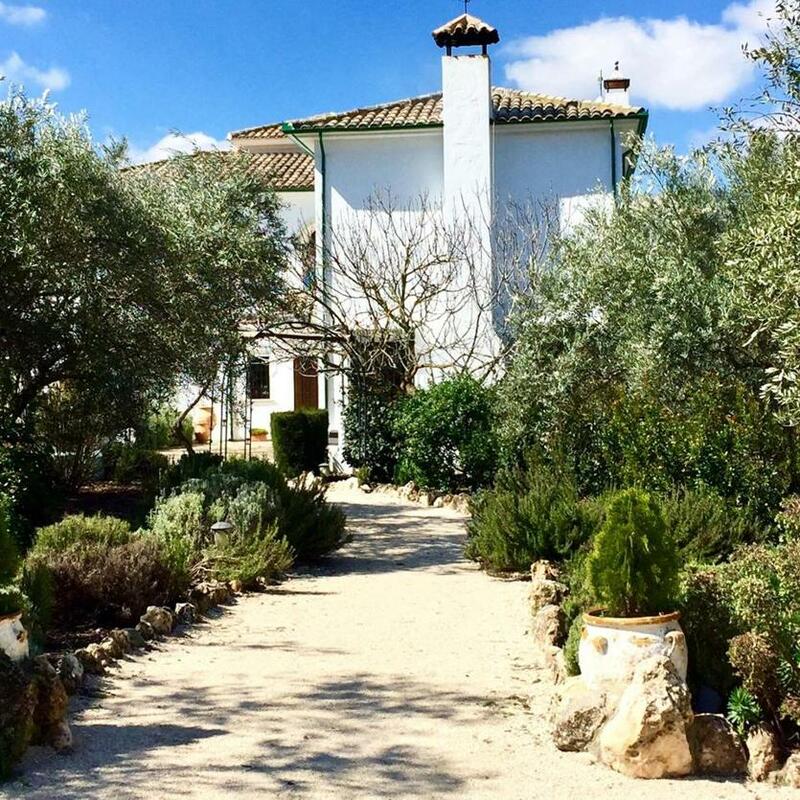 Casa Olea sits in an olive grove without commerce of any kind around it. Casa Olea (olea is Latin for olive) looks like an elegant Spanish country house. Many floors are terra cotta, walls are decorated with artwork the couple has collected around the world, rooms outfitted with antique furniture. A large center table in the dining room has a top made from an old grain-threshing board, the legs reclaimed from an olive railway. A cobblestone area outside was fashioned from an ancient threshing floor. From mid-April to early October, guests dine on a terrace overlooking the pool, where the temperature is always a few degrees cooler and breezier than in the front of the house. 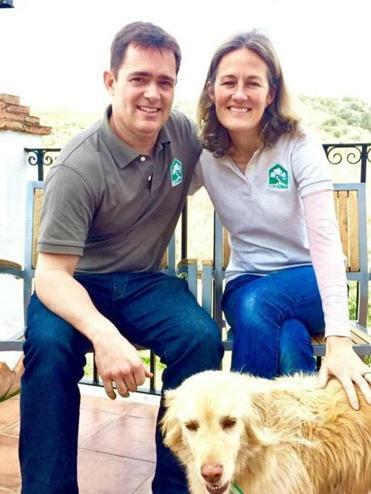 Casa Olea’s owners Tim and Claire Murray-Walker and their dog Ruby. The inn is midway between Cordoba to the northwest and Granada to the southeast, each about an hour’s drive. It takes two hours to head west to Seville, and a little over an hour to Malaga, perched on the Mediterranean, where Picasso was born. Many of the famous Pueblos Blancos (white villages) — hilly towns that are so startlingly white it’s hard to believe at first — are near the inn, as are the UNESCO World Heritage cities Ubeda and Baeza. The area has paths for walking, mountain trails for hikers and bikers, ancient mosques, churches, museums, and dazzling examples of Romanesque, Hispano-Moorish, Mudejar, Gothic, Renaissance, and Baroque architecture. So you leave the warmth of the inn after a hearty breakfast of local meats and cheese, eggs, pan con tomate (tomato puree spooned onto bread, a delicious, traditional snack all over Spain), Claire’s homemade preserves, pastries, and coffee in Bialetti Mokas or real English tea in Yorkshire pots, and drive a short or long distance to another wonderland. The innkeepers know the area well and they insist on telling you, for instance, in the most charming way, where to find the best spot for lunch where you’re headed, the most scenic route for your short or long walk, or where to buy local ceramics. They have written instructions and maps for every conceivable day trip; don’t be surprised if they highlight your route. Once you’re on the road, there are olive trees along the countryside planted so high up the hills, some look like they’re growing at an angle. When the wind blows, you see the silvery sides of the leaves so they never look very dark green. Centuries-old trees have thick, short, bulbous trunks, young ones look like rosemary sprigs, their trunks protected with white collars. Bright yellow wildflowers grow along the roads, where you find large industrial buildings, many in the same forest green color of olives, for producing the oil. Much of the bread in the region has a very tender crumb and a crust that bends, making it ideal to sop up the oil on the bottom of your plate. In 2000, Tim Murray-Walker was a tour guide in Latin America; he met Claire Cusworth in Panama. She had been at university in England and had a month off; her field was tourism and Spanish and she wanted to go to Central America. “My parents weren’t happy about me going on my own,” she says, so she looked into tours and found a trip that offered adventure, backpacking, and nice inns. She couldn’t afford it until she (literally) won the National Lottery. She took 900 pounds sterling (about $1,200) to the tour group Journey Latin America. Tim was her guide. Five nights a week, Claire, makes a superb dinner (about $24 for two courses; $30 for three) which might be trout from nearby Riofrio, or sauteed calamari, chicken roasted on lemons, pork meatballs called albondigas in a tomato-vegetable sauce, a salad with quince from the property’s trees alongside soft pan-fried cheese, paella with large prawns, and a Moorish-influenced orange-lemon olive-oil cake soaked with syrup (see recipe). You don’t need to reserve a dinner spot until the morning. On nights that dinner is offered, Claire, 39, or Tim, 46, does the marketing, buying local seasonal produce; she cooks while he tends bar and both serve dinner. 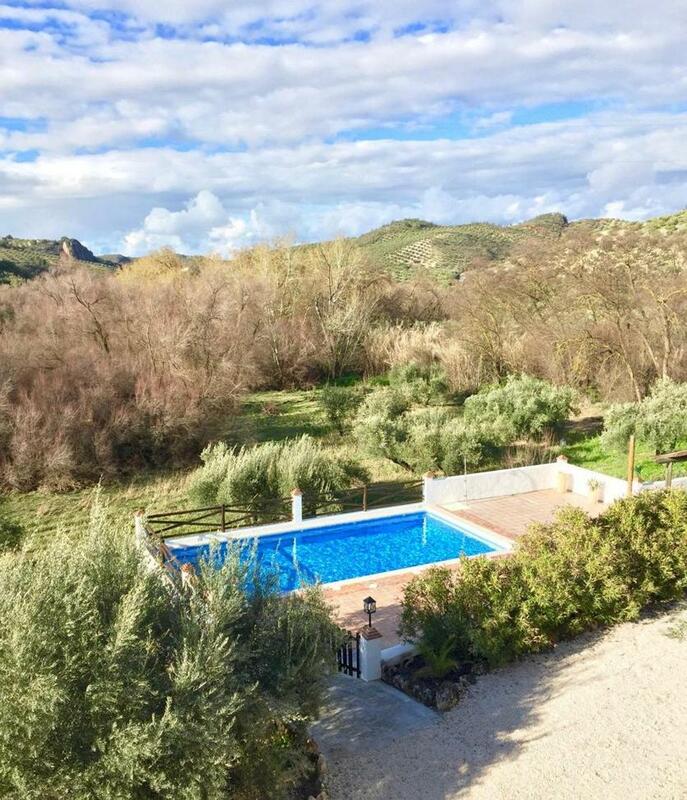 At Casa Olea, the view from the rooms is miles of olive trees in neat rows forming a kind of patchwork, the Sierras Subbeticas mountain range and a national park of the same name, and a pool that looks especially turquoise in this landscape. Every business owner has tales to tell about opening. The back story of Casa Olea is especially intriguing, not just because the innkeepers happen to be delightful storytellers. It has to do with the story itself. After much back and forth with banks, and finally securing a loan from the banker/cyclist — “He got a handle on what we were doing,” says Tim — with planning and permits behind them, they finished the renovation. Beds were in place, linens on the shelves, food in the pantry, wine in the cellar. “Everything was ready to go,” says Claire. But there was no power. They just needed someone from the local electric department to turn it on so they could move in. But the power company didn’t show up and didn’t show up. Tim went to see them daily and paid all the required fees, without results. Because the couple had already settled themselves in Casa Olea, they made do with a camp stove, bathed in the pool, and drew water in buckets from the fountain in a neighboring town. Days turned into weeks, weeks into months. Then one day in 2009, 18 months after they intended to open, a regional electric worker pulled in. “A man with a clipboard,” says Tim. “It took him 15 minutes.” The power was on. All the while, they were kept company by a stray, nearly feral, dog, who wandered over and ate anything the workmen left behind from their lunch. “I’d put out food,” says Claire, “but she wouldn’t go near it when we were around.” The couple decided that she had been poorly treated by other owners and was frightened. Today, Ruby greets visitors as you make your way along the walk. She’s beautiful and very friendly. “Such a softie and expert walking guide,” says Tim, who takes her on trails with the couple’s 5-year-old son. “Ruby the Stray is now Ruby the Princess,” says Claire. And the once-crumbling ruin is her palace. CASA OLEA, CO-7204, Cordoba province, Andalucia, www.casaolea.com. Rooms with breakfast are about $138 a night.